“It’s a blueprint for living a fabulous life, Southern style, because I believe Southerners do [entertaining and hospitality] better,” she said. Altschul, a native of Richmond, Virginia, began hosting dinner parties for friends when she was a newlywed living in Washington, D.C. They were casual affairs and couples would bring dishes to contribute to cut down on costs. She now lives in Charleston, South Carolina and is a cast member on Bravo’s hit reality television show, “Southern Charm,” which follows Altschul and eight others, including her son Whitney, as they navigate life in the Holy City. Her punctiliously planned parties are featured regularly on the program. Altschul makes sure all guests are properly introduced when they arrive so people are more friends than strangers by the time dinner is served. Some of the keys to Altschul’s successful hosting are in her wardrobe. She likes wearing caftans, especially when entertaining at home, because of their comfort and versatility. She has recently started her own line of custom caftans that offer pet owners bohemian-style gowns printed with their four-legged friend’s picture. Altschul delves into proper guest etiquette in the book as well. Among her strict rules: No cell phones during parties. Write everything down, including whom you are inviting and what food you are planning to serve. Call and invite people at least a month in advance. “It’s not a spontaneous event — you’re investing your time and money,” she said. Speaking to someone on the phone also allows for a more personal connection and you’re likely to get an RSVP sooner. Host the party in your home. It’s less intimidating and much cozier than meeting at a restaurant. If you’re planning a dinner party on a budget, serve simple, well-prepared food such as spaghetti and meatballs, salad, and homemade cookies for dessert. “The whole purpose is to get together and have fun; it’s not a gourmand roundtable,” she said. Altschul suggests allocating funds towards better alcohol. No Southern soiree would be complete without both food and liquor. Below are two of Altschul’s tried and true recipes that will bring the South to your table, no matter which side of the Mason-Dixon you call home. Ham biscuits are a staple at any Altschul party. Below is her recipe for classic Southern buttermilk biscuits. Preheat oven to 450 degrees. Mix flour, baking powder, baking soda, and salt in a bowl. Add Crisco and butter until batter reaches a crumbly consistency. Add buttermilk and stir until dough forms. Place the dough on a floured surface and dust with flour. Fold the dough into itself several times and form a round that’s about an inch thick. Use a biscuit cutter to cut individual biscuits. Line up on a cookie sheet. Bake fifteen to twenty minutes, until golden. When the biscuits have cooled, slice them open, and fill with ham. Punch is a great option if you’re hosting a crowd. Since this drink is strong, Altschul suggests serving it in punch cups, which are smaller than traditional glasses. Mix alcohol with lemon juice and sugar and let sit in the refrigerator for 24 hours to mellow it out. When ready to serve, pour over a block of ice in a punch bowl and top with thinly cut slices of orange and small strawberries. 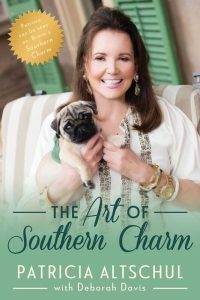 For more entertaining advice, etiquette tips, and recipes, check out “The Art of the Southern Charm” and catch Altschul “Southern Charm” every Monday at 9 p.m. on Bravo. 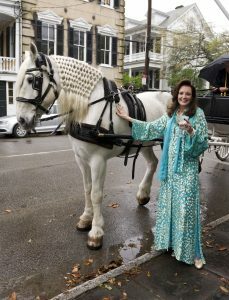 Left: Patricia Altschul during her 2015 Kentucky Derby party.